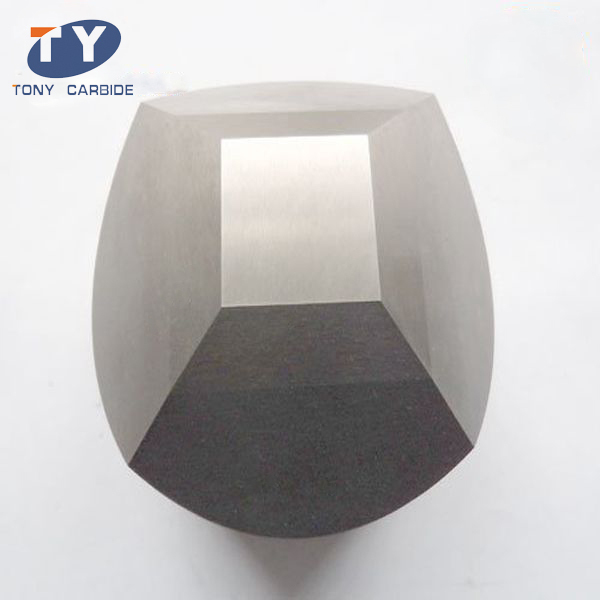 Cemented carbide anvil is a critical component for producing synthetic diamond or artificial diamond powder in high pressure and high temperature environment. Made from tungsten cobalt alloy, tungsten carbide anvil is well known for its high strength, strong wear resistance, toughness and excellent thermo stabilization. Cemented carbide anvils are installed to six synthetic diamond pressers and work in a super-critical state: 10 to 20 GPa and over 1500℃. They are able to work perfectly under such a harsh condition. The working life of tungsten carbide anvil is longer than that of similar products. YG8 (K10) is a highly recommended grade. 1. Our cemented carbide anvils are marked by their high wear resistance and superb toughness. 2. High performance enhances the productivity of perforation blades. 3. 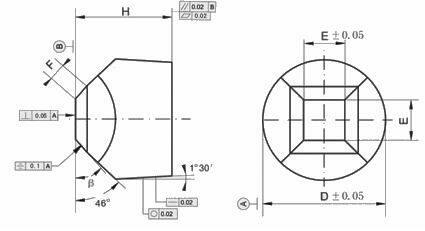 Each tungsten carbide anvil is precisely designed with true corner radii. It will ensure accurate perforation and maximum perforation blade life. 4. We have plenty 6 facet cemented carbide anvils in stock and we promise fast delivery, which will increase your machine uptime profoundly. 5. Our company provides regrinding service to increase its working life and to lower the cost. There are a few properties that need to be noticed when you choose 6 facet tungsten carbide anvils. 1. Bending strength. The bending strength of carbide anvil decreases at high temperature. Cooled by water, we can prolong its service life. The bending strength is also related to its structure. 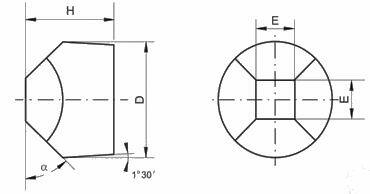 The compressive strength is the most important indicator of 6 facet cemented carbide anvils. The impact toughness is highly related to the content of free carbon. Low impact toughness may lead to fracture. The hardness of 6 facet tungsten carbide anvils indicates the compression resistance. It is related to cobalt content, WC particle size and temperature. Before use, cemented carbide anvil should undergo an anti-ageing maintenance to eliminate internal residual stress. The system’s pressure shall not exceed 85 MPa. The synthetic diamond presser must have good manufacturing and adjusting precision and the stability of synthetic diamond presser should be insured without any leakage in the system. The synchronism and centricity must be guaranteed with a deviation of no more than 0.2 mm. The 6 facet tungsten carbide anvils require a synthesizing process that is compatible with cavities for synthesization. Non-continuous operations should be avoided. Tests must be done when optimizing and adjusting the process. When the process of a single piece of equipment is stable, then it can be applied to other equipment. 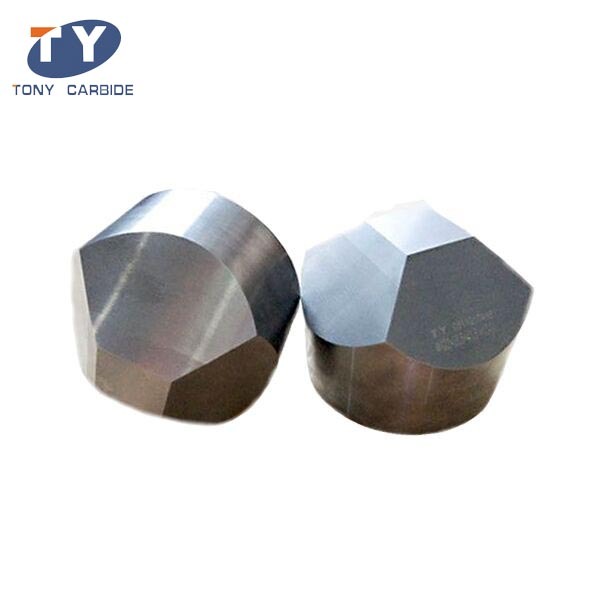 With more than ten years’ manufacturing experience of carbide products, Zhuzhou Tongyi Industry Co., Ltd. has rapidly grown into a major supplier and manufacturer of 6 facet cemented carbide anvils. Our products include tungsten carbide bits for mining tools, carbide drawing dies, carbide brazed tips, carbide rods, etc. Carbide products can be made in both standard and custom configurations. We also provide technical support for our carbide anvils.